alaTest a collecté et analysé 22 avis de consommateurs et d'experts pour le produit Samsung Metro XL (SM-B355E). La note moyenne du produit est 4.3 sur 5, tandis que les autres Téléphones Portables ont une note moyenne de 4.1 sur 5. Après analyse des notes de consommateurs et d'experts, de l'âge du produit ainsi que d'autres facteurs, et comparé aux autres Téléphones Portables, le Samsung Metro XL (SM-B355E) obtient un alaScore™ de 86/100 = Très Bien.
" Device is great and that too in such a cheap price. But UI feels slower in terms of performance than other Samsung feature phones released earlier. I hope they release a new software update with performance improvements. " " Its tooo delicate.not suitable for rough use.thank q. " " my opinion is add 3G network in this model,.. then only fullfill "
" fantastic budget phone with big display and good sound quality "
" Rear flash is amazing.everything is good but little bit slower than it's predicessor. " " Excellent phone in this price. image quality is very good in both front and rare.rare flash quality is also good. " 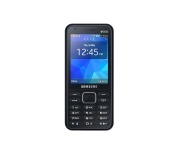 Samsung back in action with this feature phone with great front-camera! !